This very early Venice piece will always be my favourite. I dashed it off one afternoon soon after my return from the first wonderful week I spent there with my mother. Ever since my first visit to Venice I have been trying to get the reflections in the water to look as liquid in my work. I have to splash on the hot wax in a really free way. 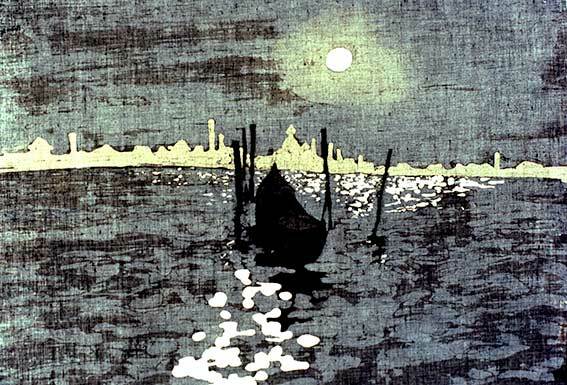 So, in this little Venice Batik the reflections of the moonlight on the water are laid on in wax in a controlled but fluid way. It's really difficult and it's so easy to overdo them. Remember, at this stage I am working on a completely white piece of cloth with a rough pencil sketch on it. I have to have the finished picture confidently fixed in my head while I work. I roughly sketched the shape of the gondola, the moon and the skyline in pencil and then worked as freely as I could manage. I used the fluidity of the hot wax to create the flowing natural shape of the reflection on the water from the moonlight. The haze around the moon I did by applying a wet tissue to the area before dyeing it. It is so hard not to over work the waxing of reflections - but this simple little study had a real magic about it - it came from the heart, capturing the romance and the way I feel about Venice.